Corymbia species include Corymbia ficifolia ‘Red Flowering Gum’ Trees, Corymbia maculata ‘Spotted Gums’ as well as Corymbia citriodora the ‘Lemon Scented Gum’. A very useful group of landscaping trees, ranging from dwarf varieties through to tall stately landscaping trees. Although it is C. ficifolia that is sought after for its flowers, other species have different landscaping attributes. All Gum Trees actually flower, the most spectacular flowers come from species such as Corymbia ficifolia the ‘Red Flowering Gum’. Corymbia also make great street trees and feature trees. 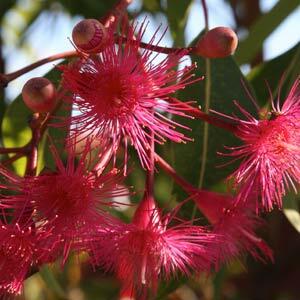 The flowering Gum Trees are popular both as feature trees in the garden as well as street trees. Over recent years a great deal of development has gone into the flowering varieties including the introduction of dwarf varieties that make excellent small garden trees. It is the hybrid plants that reach around 4 – 7 meters in height that are the most useful to landscapers. Flower colour ranges from near white through to pink and brilliant red. The dwarf varieties that reach around 2 – 3 m in height are also excellent garden plants, however most are better suited to warmer climates, generally from Sydney to the north. The grafted varieties are increasingly popular as the rootstock used is selected for hardiness in a range of soil types, this leads to improved flowering and often a more reliable height. Like many plants you can plant Corymbia at any time of the year. However for best growth it is best to look for early spring after the frosts gone. Or in autumn in frost free zones with warmer climates. You will need to provide supplementary water through the first few summers, however over watering should be avoided. Landscapers need to take care with root disturbance, root balls do not need to be teased out, and plants that are root bound should be returned to the wholesaler.